We all have a collection of recipes that we associate with comfort and familiarity. Oftentimes these date back to childhood, to a dish that signaled love or care or family tradition. In the past, I’ve mentioned that I don’t have a particularly rich tapestry of childhood comfort food association, mostly because my eating disorder started at a young age and created a certain amount of personal and familial tension at mealtimes. Still, I do have dishes that I remember with real fondness and a sense of comfort: my mom’s grilled cheese sandwiches and tomato soup. Avgolemono. My grandmother’s oven roasted potatoes and her green beans in tomato sauce. And mac n’ cheese. Like many kids, I relished good, old-fashioned mac n’ cheese from the box. I don’t remember which brand my mother picked out, but it was probably Kraft, and boy, did I love it. 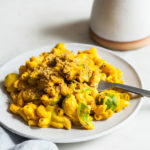 When I first went vegan, I just assumed that mac n’ cheese was a thing of the past, until I realized that there were a multitude of ingredients and methods at my disposal for creating this classic comfort food dish without a hint of dairy. I’ve experimented with a good many vegan mac n’ cheese dishes, some more complex than others. I’ve used bases of agar agar, nuts, beans, and roux. I’ve baked it, added a wide range of vegetables, and tried a number of different seasoning blends. I learned that Steven had been quite devoted to Annie’s Mac n’ Cheese when we first started dating, and he’s a pasta lover in general, so I started to fiddle around with mac n’ cheese varieties that we’d both enjoy pretty early in our relationship. The recipe I’m about to share is the one that has stuck around, the one we eat often on busy weeknights. I used to create mac n’ cheese with an all-cashew base, but over time I’ve come to love the thickness that results from adding beans as well — not to mention the additional boost of protein and micronutrients. For those who are being mindful of fat, using a combination of beans and nuts can also be a good means of lowering fat content. Needless to say, the miso and nutritional yeast combination creates that authentic, “cheesy” flavor, and I love the slight bit of heat and smokiness that cayenne and smoked paprika provide. 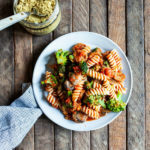 My favorite pasta brands are Tinkyada, which produces very tender and authentic brown rice pastas, Jovial, which creates both Einkorn wheat and brown rice pastas, and Bionaturae pastas, which come in both whole wheat and gluten free varieties (the latter is made with a rice, potato, and soy flour blend). You can use any of these options in the recipe, and gluten-free readers will want to opt for rice, quinoa, or gluten-free pasta blends. But do feel free to substitute any pasta that you enjoy. I happen to like elbow shapes for mac n’ cheese, but penne and fusilli and shells are all great options, too. First, make the pasta sauce. Place the cashews, beans, lemon juice, paprika, turmeric, miso, nutritional yeast, garlic, cayenne, and water into a blender or a food processor and blend/process until totally smooth. The sauce should yield about 1½ cups. Set it aside until you're ready to use it. Bring a pot of salted water to boil and add the pasta. Cook the pasta, stirring frequently, until the pasta is tender, using the package instructions to help inform cooking time. Drain the pasta and return it to the pot. Add the cooked peas. Add the sauce and fold everything together gently, until the pasta dish is creamy and evenly coated. Adjust seasoning to taste. You may not need to use all of the sauce -- if you have a few tablespoons leftover, you can reserve them as a dip or a dressing for a salad or a grain bowl, or you can use them to top leftovers. I usually use the whole batch, but sometimes I end up having a small amount leftover. Divide the mac n' cheese onto four plates or bowls and serve. Leftovers will keep for up to three days in an airtight container in the fridge. And that’s it. Such a simple, yet delicious meal. You could also sprinkle some hemp seeds or some of my hempesan topping on your plate of mac, for a little added texture and flavor! On my last post, I was asked about creating more recipes that are friendly and safe for kids with multiple allergies (Elise, who asked, has a son with peanut, tree nut, soy, wheat, and sesame allergies). 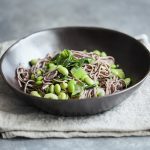 The cashews in this recipe could be replaced by using 1 full cup of beans instead, or by using hemp seeds or sunflower seeds, if you have a child who’s allergic to tree nuts but can tolerate seeds. Using chickpea miso makes it naturally soy free, too. There are many other, vegan approaches to mac n’ cheese, some of which feature heating an agar-agar and almond milk mixture, some of which feature Daiya. 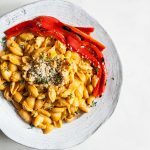 If you’re on the hunt for ideas, my friend Kathy recently created a master list of 43 vegan mac n’ cheese recipes. It’s awesome, and there are plenty of approaches represented. Worth checking out, if you’re a mac n’ cheese lover, too! No matter what mac n’ cheese recipe you choose, I hope that it’ll be comforting and tasty. And if you do try this recipe, I hope you’ll enjoy it. I wish everyone a great start to the weekend, and I’ll be back for weekend reading on Sunday. My husband and daughter are tree nut / peanut / sesame allergic too….so thank you for providing substitutions, and taking allergies into consideration! Planning on making some today with broccoli florets and carrots! This sounds perfect. These last couple of weeks have been super busy so I’ve been eating more pasta than usual. It’s just so easy for a weeknight tossed with some homemade (at the weekend!) pesto & veggies. I’ll have to try swapping in the pesto for this yummy-looking sauce. This recipe sounds delicious! I am glad you made it gluten free. Being vegan is easy, but gluten free can be a challenge sometimes. I won your book awhile back and love it. I recommended it on one of my posts for people who want to add more raw foods into their diets. I dislike peas – its a texture thing – but the brocolli and/or mushroom substitutions, or perhaps a more seasonal substitute, such as asparagas sound great. I also like the idea of blending beans and cashews, as I find many of your raw food inspired nut-heavy recipes just too fatty/sleep inducing esp. in the summer months. This looks simply wonderful, love the green mixed in. Thanks! Mac n cheese definitely makes it to my list of favorite comfort food as well! I love the fact that we can tweak it a bit to make it in this case – vegan and gluten free! The peas surely add more texture and I like the color contrast, too! Gina this looks delicious (as always)! And lighter too! Which is what I always want in a mac n cheese, as it always sounds good, but it’s so heavy I get deterred from making it. I think I found my compromise though, thanks to you. 🙂 P.S. I am so into peas right now, I keep adding them into everything I can. So you using peas makes me that much happier. I adore mac n’ cheese. I tried so many terrible vegan recipes for mac n’ cheese when I first started being vegan that I gave up hope for quite a while. They just didn’t taste like cheese to me at all. Then I stumbled upon the Veg News Vegan Mac N’ Cheese, and my whole life changed! I’ve made that one countless times, and I love the smoked paprika and cashew combination. This recipe looks just as delicious and I love the addition of peas! Thank you for sharing! I don’t have miso – is it an important ingredient? This sounds so comforting and delicious! I am sharing this on Pinterest!